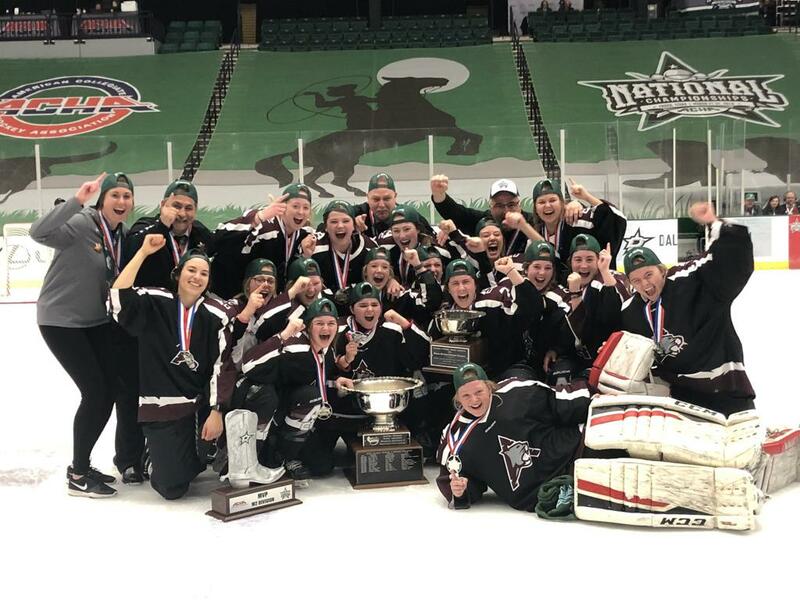 Another successful season of American Collegiate Hockey Association (ACHA) hockey is in the books, after national champions were recently crowned across five divisions in Frisco, Texas. 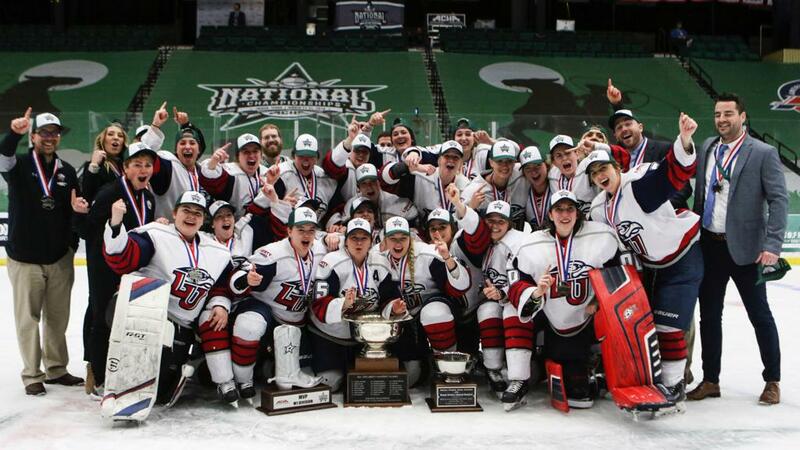 Minot State University (Men’s Division 1), Florida Gulf Coast University (Men’s Division 2), Sault College (Men’s Division 3), Liberty University (Women’s Division 1) and Assiniboine Community College (Women’s Division 2) each captured a national title. Seventy-two teams across all divisions competed March 21-31 at the Comerica Center in Frisco, the Children’s Health StarCenter in McKinney, Texas, and the Children’s Health StarCenter in Plano, Texas. 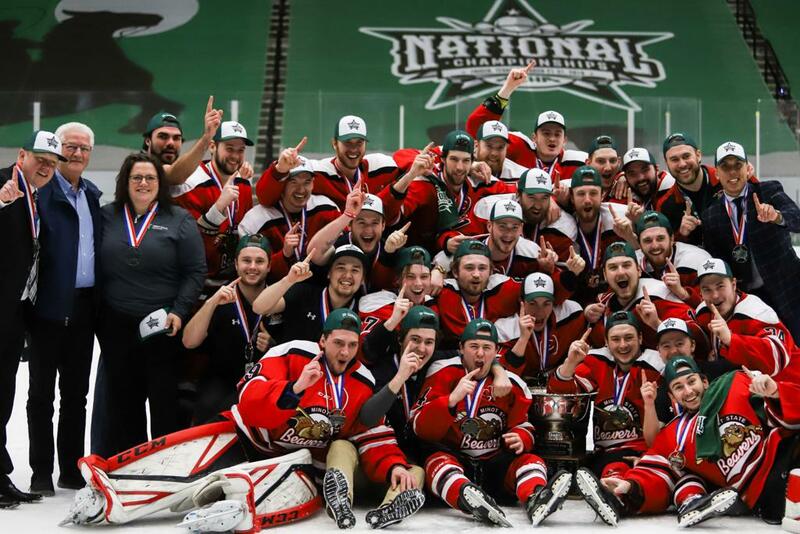 The Minot State Beavers earned their title after defeating Iowa State 3-1. The championship was the second for the Beavers, following their title after the 2012-13 season. It was Iowa State’s fifth runner-up finish. The Beavers’ Eric Bollefer earned two points (one goal and one assist) in the championship match, while Beavers goaltender Joshua Bykowski stopped 33 of 34 shots faced. Bykowski earned a .971 save percentage throughout the national championships and claimed First Team All-Tournament honors. Teammates joining Bykowski on the First Team All-Tournament Team included defenseman Kyle Lipinski and forward Rhett Lough. Minot State’s Blake Fournier was recognized at the 2019 ACHA Men’s Division 1 National Championship Most Valuable Player. Also earning First Team All-Tournament honors were Iowa State’s Nicholas Sandy and Trevor Sabo and University of Michigan-Dearborn’s Billy Brock. Dearborn’s Tyler Goat led all scorers in the tournament with seven points earned via six goals and an assist. Dearborn’s Joseph Crump and University of Buffalo senior Ryall Ledyard were each celebrating homecomings while in the Frisco area. While Frisco remains home for Crump, Ledyard was born in the area as his father, Grant, played for the Dallas Stars. The elder Ledyard’s 18-year NHL career include four years with the Buffalo Sabres and he now serves as an assistant coach with the Buffalo Bulls. When the puck drops on the 2019-20 season, Men’s Division 1 will expand to 72 teams (from the current level of 60). Included in the expansion is Grand Canyon University, jumping up from Division 2. Two new conferences, Midwest College Hockey and the Wolverine-Hoosier Athletic Conference will begin play in 2019-20. In the Men’s Division 2 National Championship, FGCU earned their second consecutive title and their fourth title in eight years with a 3-1 victory over Northeastern. FGCU’s David Wong, Dylan Cantwell and Brandon Beard each tallied two points (one goal and one assist each) in the title game while goaltender Jordan Bustard saved 25 of 26 shots. Bustard earned tournament MVP honors for his efforts after amassing an overall .943 save percentage. The University of Cincinnati’s Brandon Armstrong (six goals, three assists) and Northeastern’s Graham Doherty (five goals, four assists) led all scoring in D2. Bustard, Cantwell, Armstrong and Doherty were joined by Alex Kibrick (University of Massachusetts-Amherst) and Nick Okada (University of Cincinnati) on the First Team All-Tournament roster. The Sault College Cougars dominated Grand Valley State University 12-3 in earning their historic first national championship in Men’s Division 3. Cougars’ center Ryan Vendramin earned an opening period natural hat trick within a nine-minute span in the title contest. The sharp-shooting Sault Ste. Marie, Ontario, native scored 20 points (13 goals, seven assists) in five games. Vendramin’s teammates Bryceton Lalonde (six goals, nine assists) and Max Khull (three goals, 12 assists) each earned 15 points throughout the championship tournament. It was a second consecutive title and fourth trip to the finals in five years for the Liberty University Flames in the Women’s Division 1 tournament. A balanced offensive output in which five different players netted a goal led the Flames to the 5-2 win over Lindenwood University-Belleville in the championship game. Danica Polson, Clarissa Tipping, Lauren Mcdonald, Vanessa DeMerchant and Deena Birney tallied goals for Liberty. Liberty netminder Nadia Rupoli earned an impressive 1.04 GAA and .947 save percentage in four appearances during the tournament. Lindenwood-Belleville blueliner Lindsay Gillis was the leading scorer throughout the event with nine points (five goals, four assists) in five games for a 1.80 point per game average. The two teams dominated the First Team All-Tournament roster with Liberty’s Rupoli, DeMerchant and Emily John being joined by Lindenwood-Belleville’s Gillis, Ashley Dietmeier and Dakota McAlpine. Liberty’s Vanessa DeMerchant was named 2019 ACHA Women’s Division 1 National Championship Most Valuable Player. The Assiniboine Community College Cougars clawed their way to the Women’s Division 2 championship with a thrilling 1-0 victory over Minot State. Simon Turner-Cummer earned the game’s only goal on a first period power-play opportunity. Turner-Cummer was named Women’s Division 2 tournament MVP. The Cougars earned their place in the title game after defeating defending champion Lakehead University 2-1 in semifinal action. Assiniboine’s Jasmin Denby accumulated eight points in five games via one goal and seven assists. Minot State’s Vanessa Grimstad led in all offensive production during the national championships with 17 points (seven goals, ten assists) in five games for an incredible 3.40 points per game average. The Cougars’ Marley Quesnel posted a scant .50 GAA and .966 save percentage in four games. Quesnell, Denby and Turner-Cummer were named First Team All-Tournament. Joining them were Grimstad, Zoe Hynnes of Lakehead University and Alyssa Hansen of North Dakota State University. The number of ACHA women’s hockey programs has increased to 72 teams in 2018-19 from 38 in 2012-13. The ACHA National Championships will return to Frisco for the 2019-20 season.